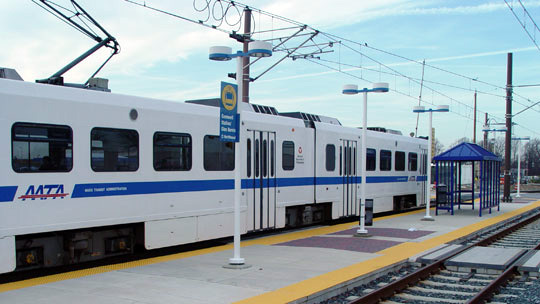 GL Communications is participating in the design, planning, and operations of communications systems for many mass transit systems. In this and future newsletters we will share some of the more interesting aspects of these projects. GL Supports Light Rail System in Baltimore, MD. In this issue we highlight our technical support to the Light Rail System in Baltimore, MD. We continue to support the communications infrastructure upgrade of the Light Rail System in Baltimore, MD. The upgrade project involves a fiber optic system along the rail road right of way, a WAN open transport network, a frame relay network for automatic fare collection, and other communications systems. Other aspects that GL is involved, includes train control and customer information systems, such as ADA compliant Public Address and Signage systems. Fiber Optic Infrastructure Build-out - GL provided inspections, terminations, splicing, and testing services using sophisticated tools - OTDR and precision power meters. Integration of existing and new systems - Inspected retrofitting of existing light rail vehicles to the new Automatic Train Protection (ATP) signaling system. Traction Power Substations and Overhead Catenary System - Supported installation of the Light Rail Overhead Catenary system and its integration with the traction power substations. Light Rail Control Integration (LRCI) - Supported the development of new LRCI software Graphical User Interface (GUI) for train control systems. GL provided technical specification, system construction, management inspection and end-to-end testing services.